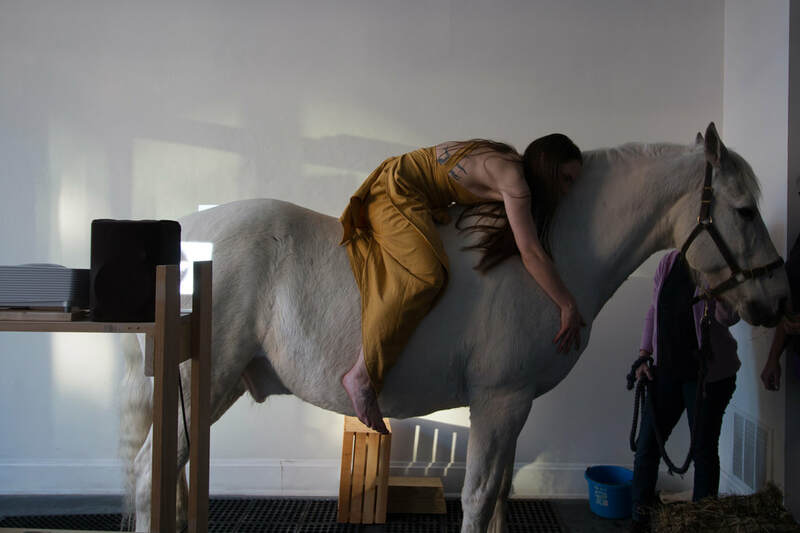 Epona is a multimedia performance that lives out the myth of Epona, a Gaulish (Celtic) goddess and protector of horses, donkeys, foals and mules. Epona was fathered by a figure who despised women so he fornicated with a mare; Epona was the result. 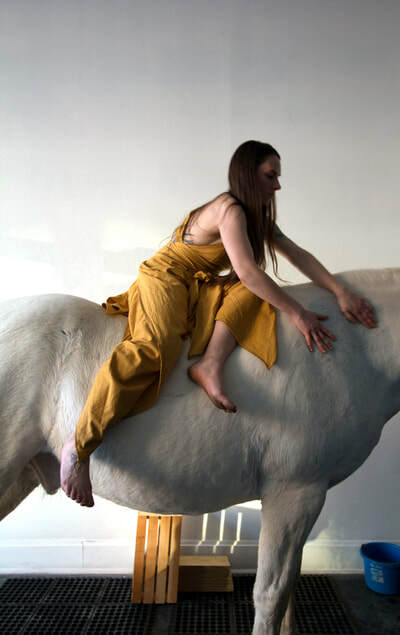 In imagery, she is often pictured with a cornucopia and alongside or on top of a white horse. 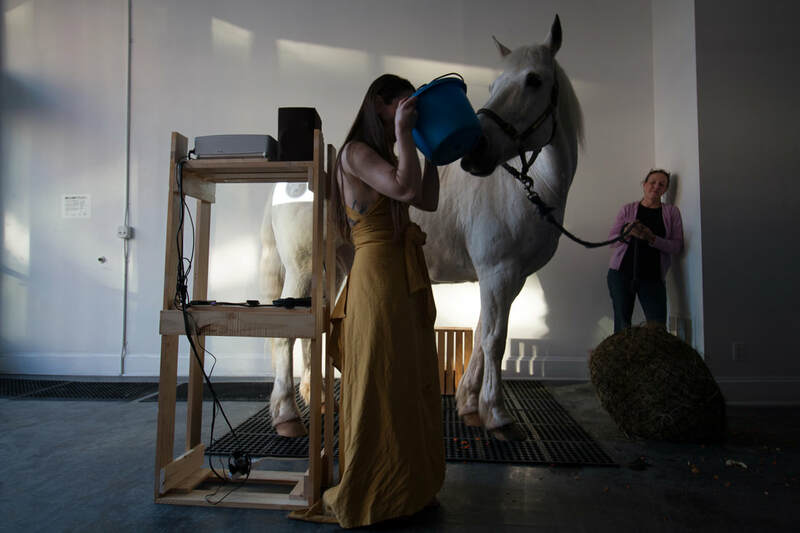 Epona investigates interspecies kinship through a combination of performance, video, and interspecies cooperation. 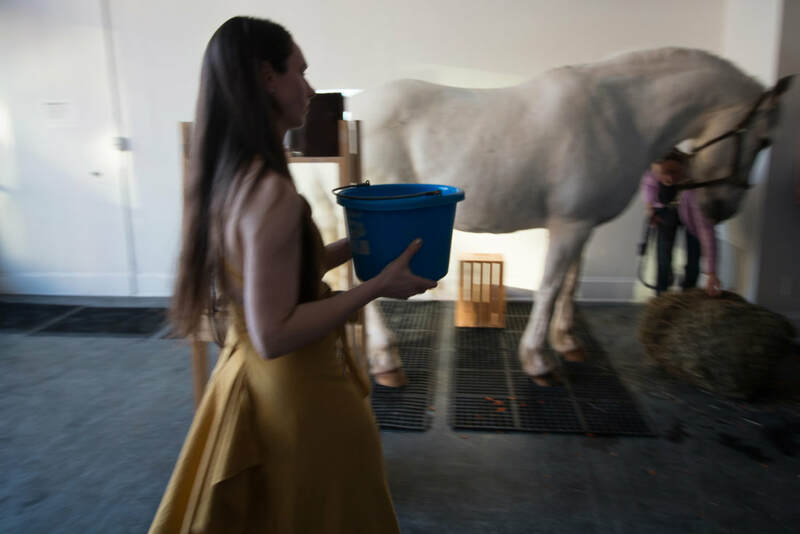 The performance plays with time and presence, highlighting the ancient nature of the woman/horse covenant and the ethos of this kinship: before the industrial revolution, draft horses served a utilitarian purpose for humans. In the contemporary Midwest, draft horses primarily satisfy emotional needs and ontological security. 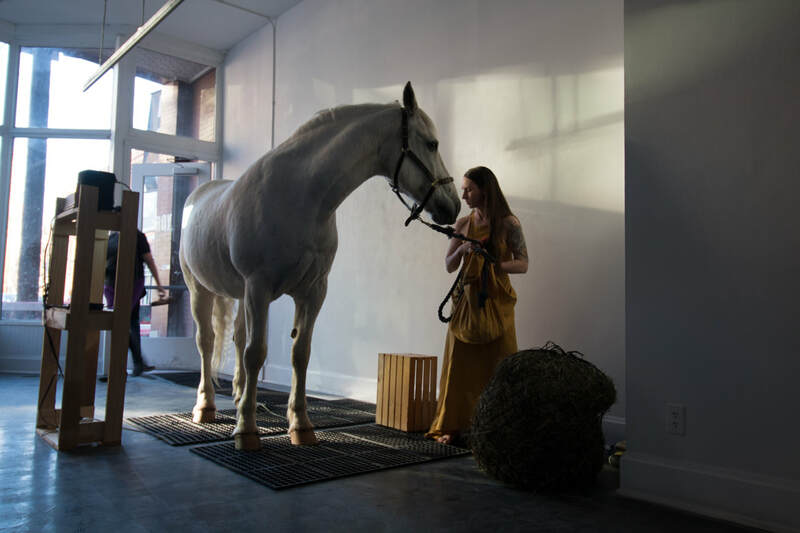 It is because of kinship that specific breeds of horses continue to exist and one might argue that the invariably high participation rates for equestriennes are solely responsible for the protection and nurturing of this specific kin relationship. Perhaps problematized by the gallery space itself, the work also nods to the place of women and horses in the canon of art history. 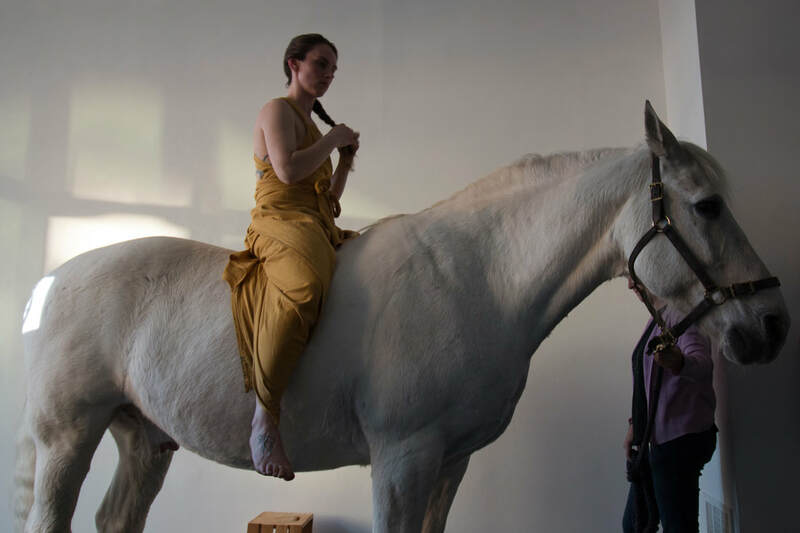 Upon visual analysis, a viewer sees a particularly un-revolutionary idea: a woman and her horse carefully posed in front of a stark-white gallery wall. This is not unlike the hundreds of thousands of paintings of horses that span the entirety of art history. If this wall is a home for this contemporary interspecies painting, the horse and performer are, despite a relative ease, uncannily out of place. 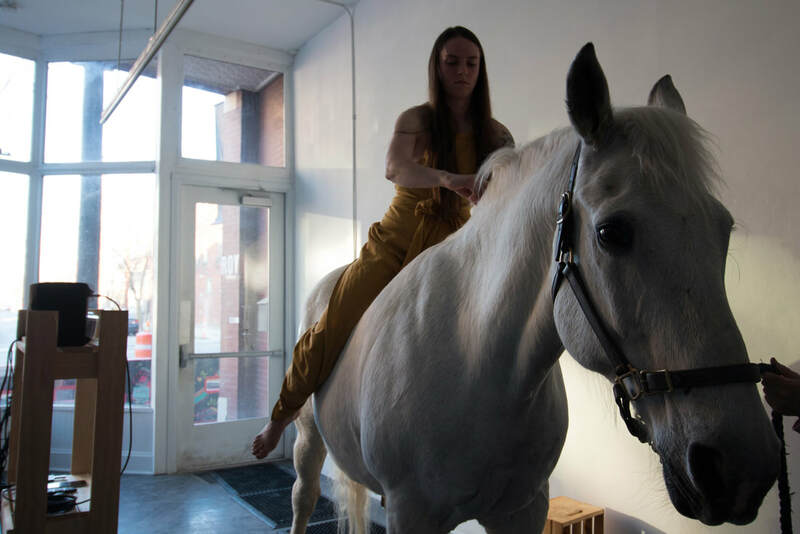 This work is inspired by Kim Marra’s Horseback Views: A Queer Hippological Performance and Deke Weaver’s multimedia performances in The Unreliable Bestiary. 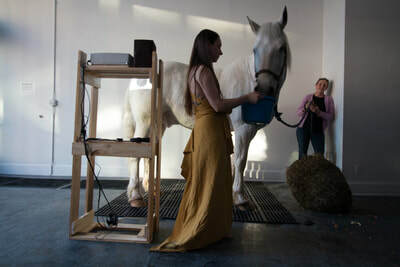 Yet in Epona, the audience is privy to the multisensory presence of Griffin himself. He will breathe, snot, shake, eat. The audience will hear him, smell him, and see him. 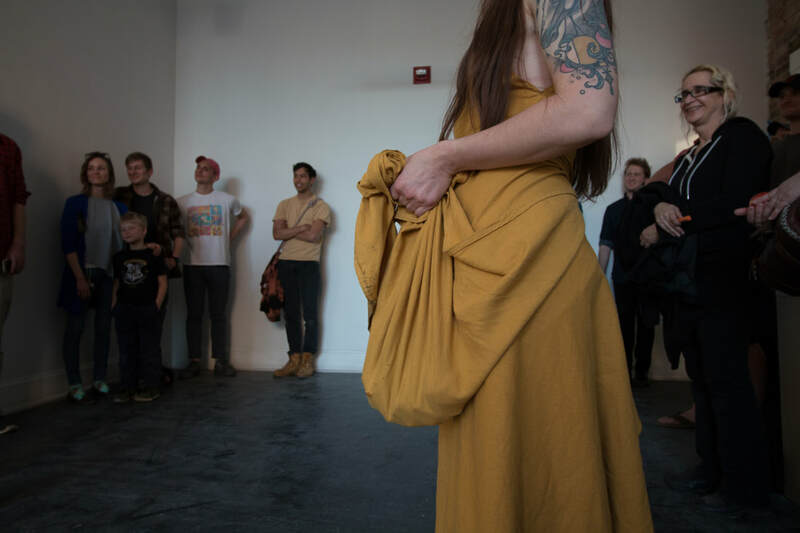 Griffin will react to the energy of the audience; his presence alone rears viewers into a place where they have stake in the work. 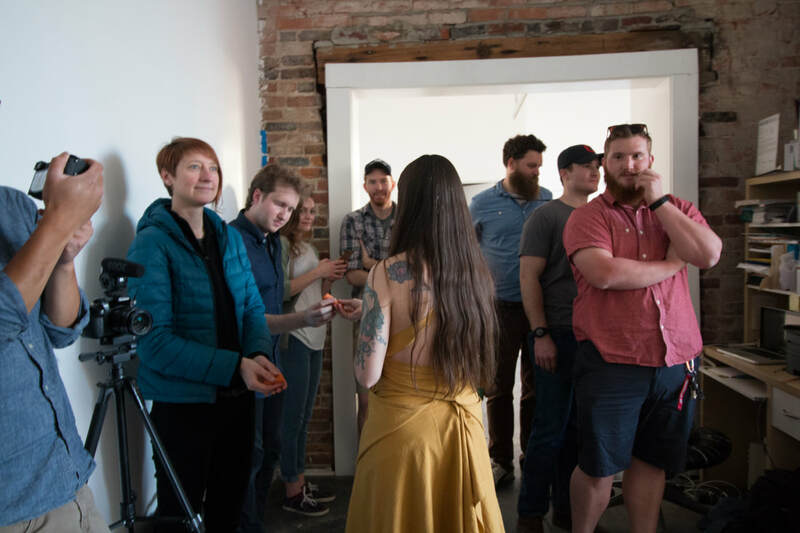 In itself, the combination of storytelling, live elements, and use of multimedia is a microcosm for a layperson’s contemporary relationship to domesticated farm animals: these animals exist in stories, we see them on various digital platforms and, from time-to-time, we come across one in our urban society. But these animals no longer live alongside us. Thus, as women eventually shed their of-the-house-ness, domesticated farm animals followed. The myth of Epona and subsequent performance intends to remind humans of our role in this ancient interspecies covenant. Performance begins. 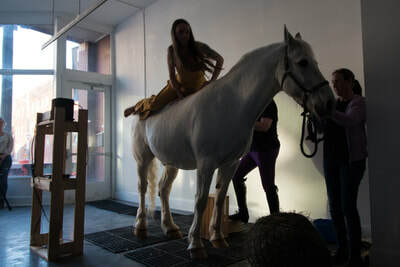 Performer leads horse into space from the exterior of the gallery. 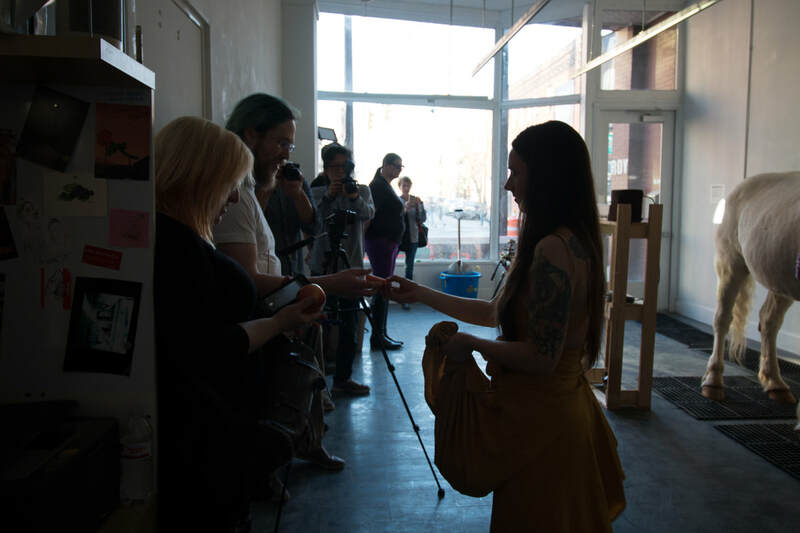 We arrive at the predetermined performance space within the gallery (to be arranged with ROYGBIV). Performer offers to the audience, carrots, corn, and apples from her apron. 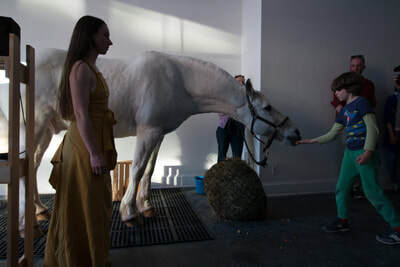 Performer offers carrots and apples to Griffin. Performer offers audience, then Griffin, a drink from the water bucket. 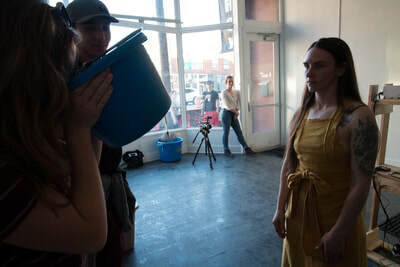 Performer takes a drink from the bucket. A pre-recorded audio narrative begins to play, detailing in first person the myth of Epona. A simple animation is projected onto Griffin’s rump as the audio continues to play. The performer affectionately runs her hands down Griffin’s legs (a common practice before riding to check for any heat) and brushes his face and neck. Performer places wooden stool alongside Griffin’s belly and mounts the horse. Performer sits side saddle position and continues to brush Griffin from his back. 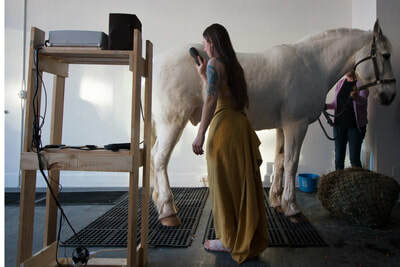 Performer braids Griffin’s mane then brushes and braids her own hair. After, she eats an apple and dismounts. Audio and animation conclude. Performer leads horse out of the gallery. 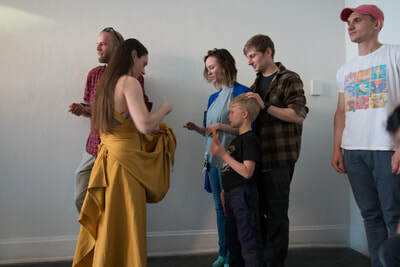 Performance ends. 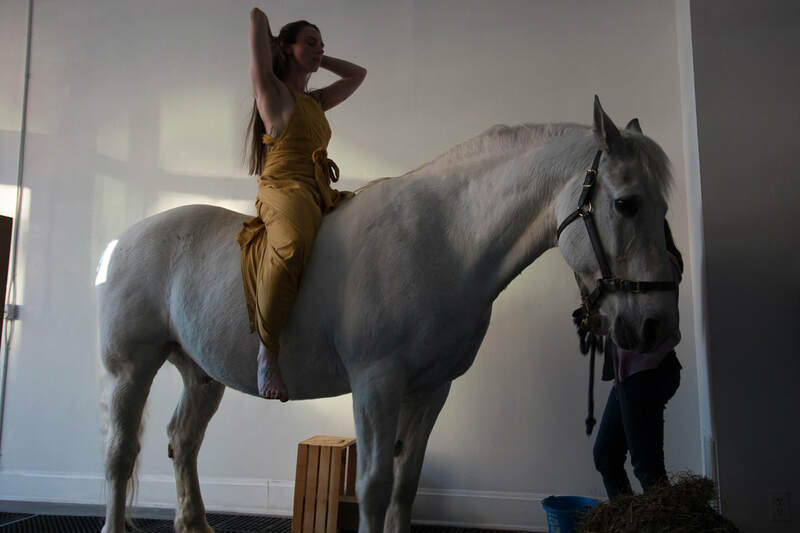 Epona Performance Animation from Ruth K. Burke on Vimeo. Special thanks to April Hill Kennedy, Mara Protich, and ROY G BIV Gallery.